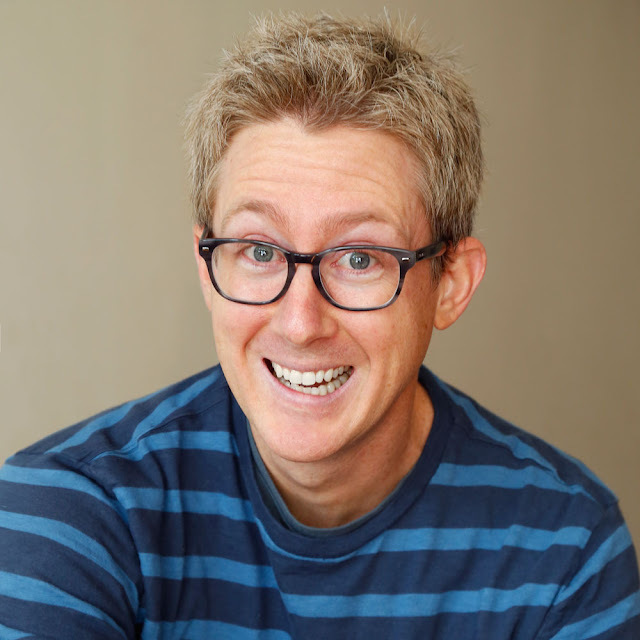 We are excited to feature picture book author Tim McCanna! Tim has four picture books out this year: BITTY BOT'S BIG BEACH GETAWAY, illustrated by Tad Carpenter (Simon & Schuster/Paula Wiseman Books); JACK B. NINJA, illustrated by Stephen Savage (Orchard Books); BOING! 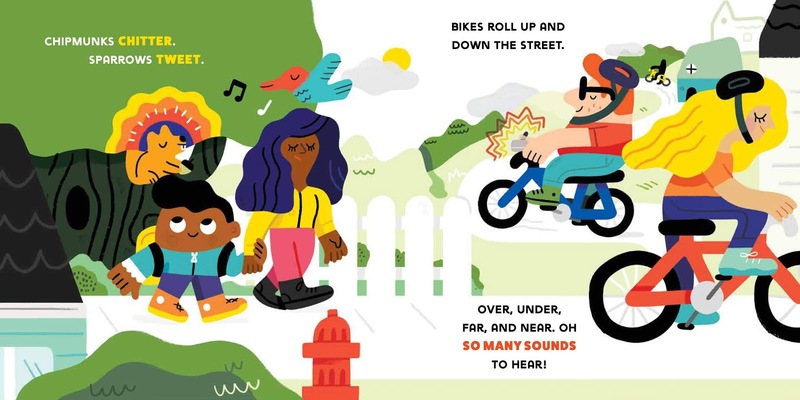 A VERY NOISY ABC, illustrated by Jorge Martin (Simon & Schuster/Paula Wiseman Books); and SO MANY SOUNDS, illustrated by Andy J. Miller (Harry N. Abrams). Enter to win one of his books! Four winners will be chosen. Well, I didn’t originally set out to become a children’s author, but my creative work over the years sort of paved the way for me. From the 1990s to the early 2000s I sang and played accordion in various rock bands, performed in theatre, wrote a lot of songs and musicals, and worked as a graphic designer. Once my wife and I had a couple kids, we started reading picture books to them, and I grew a love for the art form. So, around 2009 I decided to give it a try! I figured all that creative background I had would help, and it did—to a point. Having an MFA in Dramatic Writing for Musical Theatre from NYU had toughened my skin and taught me to cut and revise and trust my instincts. But successful picture books are tougher to write than most people realize, and the publishing industry definitely has its quirks. It took joining SCBWI and about four years of trial and error before I sold my first manuscript. Congrats on your banner year of publication - four books out! Please tell us about each of them and what inspired you. Thanks! It’s been a really fun year seeing these books released into the world and being able to share them with kids and adults. BITTY BOT's BIG BEACH GETAWAY was a sequel to Bitty Bot, which came out in 2016. In fact, Bitty Bot was the first manuscript my agent sold for me in a 2-book deal. But I hadn’t written a second Bitty Bot book and didn’t know if I could! Since Bitty went to space and met aliens in the first story, I thought it’d be fun to take Bitty and some friends under the sea and meet mermaids. 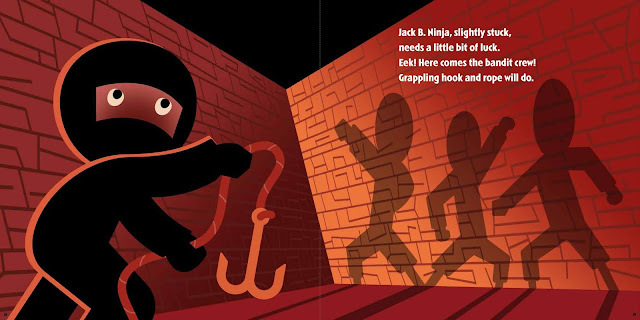 JACK B. NINJA started as just a title idea that rattled in the back of my mind for a year or so. Once I sat down and wrote the opening line, Jack B. Ninja! Jack be quick! Jack, jump over the bamboo stick!, I was off and running. But I learned that creating satisfying endings is tough, and it took several rewrites to figure out what was in the stolen treasure chest that Jack recovers from a bandit cave. BOING! A VERY NOISY ABC was originally just an alphabetical list of noise words, or onomatopoeia. But then I thought, what if I could actually incorporate a story just using these sounds? It was a challenging but very fun process of reverse engineering in which a sneeze “A-A-A-choo!” starts with the letter A and sets off a crazy chain of events in alphabetical order. SO MANY SOUNDS actually came out of a pass (I don’t like to call them rejections). The editor passed on a different story, but asked if I’d be interested in doing something for very young kids on music or sound. I jumped at the opportunity which resulted in Barnyard Boogie! about animals playing musical instruments, and So Many Sounds about all the sounds we hear throughout the day. My first published picture book was called TEENY TINY TRUCKS. I sold that one on my own in 2012 to a very small publisher. We had a great time bringing that book to life. But, the publishing industry is tough, and they went out of business, which means that book is now out of print. It happens. After I got my agent in 2014, we started selling manuscripts to the big houses like Simon & Schuster, Abrams, and Scholastic. 2018 has been a rewarding year of seeing a lot of time and effort pay off. Doesn’t mean that everything I write now gets published. Quite the contrary. So, the road continues to twist and turn in fun and unexpected ways. I’ve always got a few picture book ideas I’m working on in various stages. I have a great critique group that helps me see my writing through fresh eyes. They’ve been instrumental in suggesting revisions and lending moral support. I’ve also jumped into writing middle grade novels and am hoping to start submitting those to publishers in the near future. Patience, patience, patience. Stick to your craft and stay productive. Publishing will happen when it’s supposed to happen, so just work on being the best writer you can be. I would tell my younger self that, and I still tell myself that now! In 2010 we had this big 52” flat screen TV. Around that time I was reading Stephen King’s On Writing, and he said if you’re just starting out as a writer, your television should be the first thing to go. I took that to heart, so I cancelled our cable service and sold our TV. We haven’t had one since. My website is www.timmccanna.com and I’m on Twitter at @timmccanna. 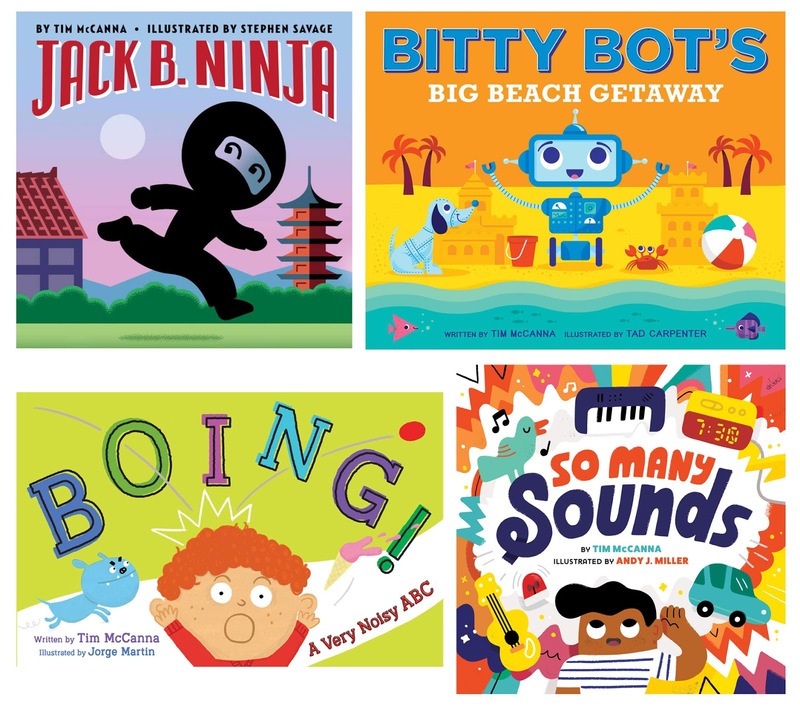 Tim McCanna is the author of JACK B. NINJA (Scholastic/Orchard Books), BARNYARD BOOGIE and SO MANY SOUNDS (Abrams Appleseed), BITTY BOT, BITTY BOT’S BIG BEACH GETAWAY, BOING! A Very Noisy ABC, and WATERSONG (Simon & Schuster/Paula Wiseman Books), which was a 2017 New York Public Library Best Book for Kids and National Council of Teachers of English Notable Poetry Book. Tim served five years as Assistant Regional Advisor for SCBWI’s San Francisco/South chapter, and he holds an MFA in Dramatic Writing for Musical Theatre from NYU’s Tisch School of the Arts. He lives in San Jose with his wife and two kids. Find Tim online at www.timmccanna.com. I love reading about different author journeys. Thank you for sharing! Love the sound of these books, especially the noisy ABC book. Clever and fun. Can't wait to read them all. Congrats on a banner year AND getting rid of your tv set. I'd so like to do that!! There's a fun theatrical quality to Tim's books, so I'm not at all surprised that he has a musical theatre background. As Katrine Moore said, "picture books are lap-sized theatres." Love Tim's books! Bitty Bot's Big Beach Getaway is a finalist for the Angie Karcher 2018 Best in Rhyme award! These all look so fun to read, but I'm especially anxious to read Boing! What a great concept! I'm excited to read these books. I always enjoy these interviews and learning where ideas come from and then develop into picture books. Stephen King's advice is interesting--I don't watch much TV other than the news as I'd rather immerse myself in books. All his books have such great graphics--I think "Bitty Bot's Big Beach Getaway" is my favorite! Thanks for the informative interview. Your books look right up my alley! I'll look for them! Your story is so relatable, and it's encouraging to hear of your success. I love your books, by the way! Great advice! I've been too hooked on TV! Congratulations on your books! What beautiful colours and big basic shapes. Great interview! Congrats on a banner year in PBs!